Google is the #1 search engine in the world and seemingly the best place for marketing. Google offers Google Merchant Center to allow eCommerce stores to promote their products through Google. Today, about 28% of all online stores use WooCommerce, and almost all of them promote their products on Google Merchant Center. Besides getting easier access to Google Analytics and AdWords, Google Merchant Center also displays products individually in the Shopping section of Google search results. This allows people to be aware of options to products without getting into websites yet. Having products in Google Merchant Center also means that you can have access to Dynamic Remarketing. All in all, this is the best place to increase your sales. But, you will need to know how to properly optimize your Google Product Feed so that your feed is accepted and scale up your conversion. Your WooCommerce store may include many variations and attributes for your products, but Google Merchant Center has its own set of requirements which you must meet in order to upload your products. Your website may have custom categories, different from Google. But Google has its own taxonomy list, and you must submit a feed accordingly. You must ensure that, in your Google product feed, all the products are categorized according to the Google taxonomy list. When generating product feed, you must map your categories with Google category list, or else Google won’t accept it. Also when mapping, be as specific as possible and categorize the product under the most relevant sub-heading. This will narrow down search results for targeted customers, hence more chance of conversion. Your product title is what Google relies on when deciding how relevant your product is to a customer’s search phrase. Plus the title acts as a hook, to grab customers attention and to create more interest. Google allows you to write a title of up to 150 characters. It is wise to give a title that says what your product is, and some of its best features that people search. If you are selling a Tuxedo for a particular brand — let’s assume ‘Rexth Clothing’ as a brand. You can choose the title “Rexth Ultralight Black Modern Fit Tuxedo With Golden Buttons.” This title highlights the brand, the color, the type, the product itself and one of its exclusive features. Now, basic Google previews will only show 35 characters only. So try to make the first 35 characters relevant to what people might search when looking for this particular product. Inside the Google Merchant Portal, it will only display 75 characters and the rest will show when the customer clicks on your product. Which means you should include your best keywords within the first 75 characters. Most shop owners write titles with 75 characters and include target keywords there. They do this for both Google search engine purpose and Google Merchant Center. **P.S. : Don’t add promotional phrases to your title such as “Limited offer,” “Special Discount,” etc. Google algorithms take these negatively. After searching for a product on Google, a person will be able to see a preview of the details of your product. These details include the title, description, review rating, price, etc. For description, even though you can write up to 5000 characters, the first couple of lines are crucial. The description on Google Shopping Preview will only display the first 175 characters of the actual description. Thus you should try to include the best benefits and features of your products on the first couple of lines. This will act as a trigger to create ‘desire’ in customers. Try to make it precise and not a marketing promotion of your site. As we mentioned earlier, the beginning of the product description is crucial and should be catchy while including targeted keywords. But this doesn’t change the fact that you have to write a proper description nonetheless. Make the description as detailed as possible and include all the features and benefits of your product. Also, keep in mind about SEO attributes when writing the description. Make sure to include keywords and avoid including any irrelevant data. Do not give any misinformation. Reminding you that just one bad review can lower your rankings on Google search. Even though you may have multiple images for your product, Google will specifically ask for an image link to a picture of your product, which will be used as the preview photo in the search results. It is best to create a high-quality Image for this purpose. Now, most shop owners directly take images from the manufacturers’ sites; thus almost all of their previews are about the same. The smart thing to do here is to try and give a picture which is different and will stand out. You can take a photo on your own or search for a uniquely clicked photo of the same product and use them (as long it is not a copyright infringement) as the image for your product. Having a unique photo on display, among others who all look similar to each other, will create more curiosity among customers. A different picture stands out and grabs customer attention. But do make sure not to add extra promotional texts on the images. Also, it is advised to give an image with a white background. Apart from the product category, title, description and image, there are few more data which you must include in your product feed. You can choose from the options, ‘in stock’, ‘out of stock’ or ‘pre-order’. This information has to be included on your feed and later updated according to current availability on a regular basis. **P.S. : Failure to deliver, while saying the product is available, has a negative impact. One bad review from a customer can affect Google’s priority on your products. Hence, be honest about the availability. You need to specify the product price and currency. Make sure to include VAT within the price (except in USA, Canada or India). Most customers expect to pay exactly what is mentioned. (The only extra fee people may agree to pay is the shipping charge). **Note: Don’t tweak your Google product feed and make it different from your actual site, at least in case of the data that are to be displayed on the preview. Once you provide the data, Google will cross check with your website. Any mismatch and Google will penalize your ranking. This is a unique product identifier for any products (often in the form of barcodes). You may know GTIN as UPC (if in North America), EAN/UCC (if in most places outside North America), JAN (if in Japan), ISBN (if you deal with books), etc. There are more countries which call it by different names, but all serve the same purpose. Often products may have multiple GTINs. In that case, you may choose either one. If you are offering a package with numerous products, then providing the GTIN of any one of the products will be fine. GTIN is not a marketing term or a feature of the product. But Google algorithm gives more priority to products that have GTIN. So its best to include it. MPN is a unique identifier of each product, deduced by the manufacturer. You will be required to include this in case you don’t have a GTIN for any product. **In case you have a product with no GTIN or MPN, you need to mark the ‘identifier_exists’ attribute of that particular product as false. Not marking it false will automatically be considered as true, and Google will look for a GTIN in your product feed. In this case, your product feed will be rejected. You will need to provide a direct link to the product, not the root domain. Google will ask for the name of the manufacturer, not your company or any distributors. So don’t include your name in this field unless it is your own manufactured product. The product ID is the code you assigned to your products on your website. This will allow you to keep track of your products from Google to your site. 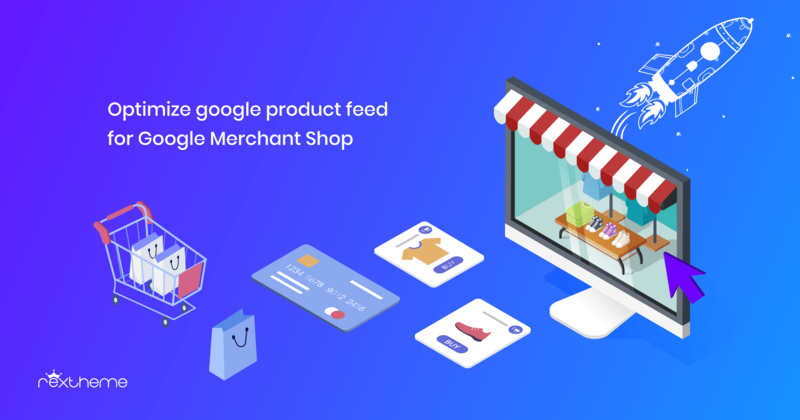 Google Merchant Shop is a must for any WooCommerce shop owners, who want more potential customers. Make sure you have created a proper Google Product Feed. In case you are not confident in creating on your own, you can use plugins or feed management companies. WooCommerce Product Feed Manager is a plugin (developed by us) that is simple to use and will help you generate Google Product Feed with no hassle. It has a built-in feed format set up for Google and many other merchants shops. This plugin will let you map categories very easily, and all you will need to do is select the products you want to generate a feed for. It will create a feed which you can auto-sync with your Google Merchant Shop, and with little or no changes, your products will be up on Google Shipping. You may try using its free version and see if it suits you.